A woman working at the Tim Horton's coffee and bakery shop suggested that I do this to my hot apple cider. 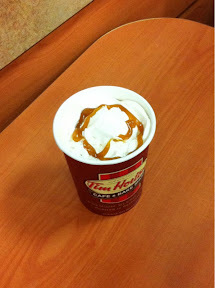 Never had I heard about doing such a thing before- adding whipped cream and caramel to top off the hot cider. Tasted like a caramel apple, she said. And it did, to my delighted surprise. My apologies for the brief post tonight- today was personally not a good day. Although earlier was fantastic- we ventured out to an October cemetery and I am preparing quite the post for tomorrow evening.